Dr. Current, who had lived in Natick since 1987, addressed seemingly contradictory elements of Abraham Lincoln’s life and thought, particularly about slavery and race. 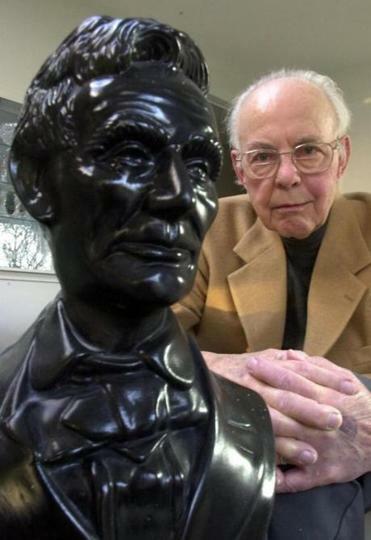 Richard Nelson Current, a historian whose elegant books on Abraham Lincoln led to a deeper understanding of the character and thought of the 16th president, died Oct. 26 at a hospital in Boston. He was 100. He had complications from Parkinson’s disease, said his wife, Marcia Ewing Current. Dr. Current was a wide-ranging scholar of American history who came late to the study of Lincoln. He had already written books on 19th-century political leaders and the history of the typewriter when he was asked to complete a four-volume biography of Lincoln begun by his University of Illinois colleague, J.G. Randall. Randall had published three volumes before he died in 1953. Dr. Current wrote at least half of the fourth volume, ‘‘Lincoln the President: Midstream to the Last Full Measure,’’ which appeared in 1955 and won the prestigious Bancroft Prize, an annual award presented by Columbia University for a book of history. Dr. Current went on to write seven more books about Lincoln, drawn to what he called the ‘‘perpetual timeliness’’ and ‘‘eternal relevance’’ of Lincoln’s presidency and life. One of his most influential books was ‘‘The Lincoln Nobody Knows’’ (1958), which addressed seemingly contradictory elements of Lincoln’s life and thought, particularly about slavery and race. Dr. Current showed how Lincoln overcame the narrow thinking of his childhood in the backwoods of Kentucky and Indiana, where racist views were common. Holzer, whose young-adult biography of Lincoln will be published this week to accompany the forthcoming Steven Spielberg movie ‘‘Lincoln,’’ described Dr. Current as the ‘‘dean of Lincoln scholars,’’ along with David Herbert Donald, who died in 2009, and Don E. Fehrenbacher, who died in 1997. Dr. Current taught at the University of Illinois and the University of Wisconsin but spent the largest portion of his career at the University of North Carolina at Greensboro. He had lived in Natick since 1987. Rare among academics, Dr. Current was a deft writer whose sensitive, stylish prose appealed to many readers. In his 1963 book, ‘‘Lincoln and the First Shot,’’ Dr. Current described how Lincoln built a unity of purpose in the Northern states before the Civil War began in earnest. He maintained that Lincoln had a more sophisticated knowledge of the law, economics, and military tactics than earlier historians had thought. Dr. Current also sought to dispel many myths that grew up around Lincoln, including the notion that some of his Cabinet members conspired in his assassination. In the 1980s, he had a running feud in the letters column of the New York Review of Books with Gore Vidal, who published a novel about Lincoln in 1984. He accused Vidal, who died July 31, of willfully distorting the historical record, of misrepresenting Lincoln’s views, and of ‘‘utter ignorance’’ of the linguistic differences between British and American English. Richard Nelson Current was born in 1912, in Colorado City, Colo., and was a 1934 graduate of Oberlin College in Ohio. He received a master’s degree in 1935 from the Tufts University school of diplomacy and a doctorate in history from the University of Wisconsin in 1940. He published the first of more than 30 books in 1942. He was the co-author of several textbooks on American history, as well as biographies of 19th-century congressional leaders Thaddeus Stevens, Daniel Webster, and John C. Calhoun. In 1954, one year before his first book on Lincoln, he published a history of the typewriter. Dr. Current lectured on history on six continents, including Antarctica, and taught at many colleges. In 1997, Dr. Current and his second wife published a biography of dancer Loie Fuller. His final book, a collection of translations of writings by the Norwegian author Knut Hamsun, appeared in 2003. His first wife, Rose Bonar Current, died in 1983 after 45 years of marriage. He leaves his wife of 28 years, Marcia Ewing Current of Natick; two children from his first marriage, Dana of Frankfurt and Annabelle of Omaha; two sisters; three grandchildren; and two great-granddaughters.